The Chinese Chess Championships for men and women is taking place from 16th to 27th April 2013 in Xinghua, Jiangsu, China. After his early defeat against Ma Qun, rating favorite Wang Yue has recovered his form and now shares the lead with Wei Yi. 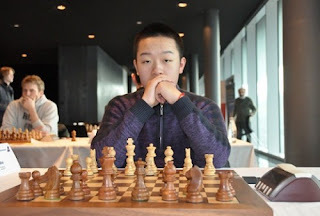 The 14-years old prodigy from China has not suffered a loss in the event. Sunday is a rest day and the two leaders will be paired on in the sixth round. Wang Yue defeated Bu Xiangzhi in the third round and obtained the only decisive result in his favor during the fifth, when he beat Xiu Deshun. He managed to win both these games using his trademark positional style, demonstrating his ability to slowly maneuver to get a winning position. On the other hand, the youngest GM in the world, Wei Yi, scored his two wins in tactical fashion. In both games, against Xiu Deshun and Li Chao, he was not able to castle. Instead, he went for the initiative to eventually outplay his opponents. Third and fourth places are shared by early leader Ma Qun and the ex-women’s world champion Hou Yifan, who once again is participating in the open event. WGM Ding Yixin is dominating the field in the women’s tournament. She has 4.5/5 points and her closest follower is already a whole point behind.